There are fears that the severe weather conditions could lead to some people not receiving deliveries of food and presents in time for Christmas. 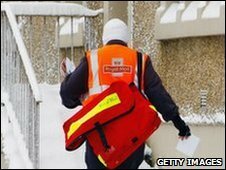 Royal Mail says 5% of its deliveries have been disrupted, while supermarkets are also experiencing delays. Asda says it is sending staff out in taxis and extending its delivery time to Christmas Eve, while Tesco has also increased its staffing. Sainsbury's said up to 1% of its orders were disrupted. It added that customers were being offered alternative delivery times where possible. "Where we are unable to do so due to the high level of customer demand in the run up to Christmas, we are informing those customers immediately so they are able to make alternative arrangements," a Sainsbury's spokesperson said. "In some cases where we can't deliver, customers are given the option of collecting their shopping from the stores direct." John Lewis also said it was experiencing some disruption. "Where we discover that customers are going to be affected we are contacting them to let them know and helping them find alternative solutions at their local John Lewis," the company said. Online retailer Amazon said some orders may experience a short delay but it expected to complete all deliveries by Christmas. How are airports kept open? How exactly do you grit a road? Why doesn't Scotland grind to a halt?